the hubs birthday is today. he's been threatening to shave off his goatee because he swears there are gray hairs popping up in it. i keep telling him they are actually blond & he should be more worried about his failing eye sight. or his receding hair line. but he's pretty safe, seeing how i personally think bruce willis, who is most definitely bald, is pretty much the sexiest man ever. as long as he keeps me laughing, i plan on keeping him around....even if he is bald, blind & has gray in his 'stache. when they say the way to a man's heart is through his stomach, they are TOTALLY talking about my hubs. he is without a doubt a steak & potatoes man. i haven't been able to get him a gift yet..
so i figured the least i could do was cook him up a good meal of steak & potatoes for his birthday. pinterest is both a blessing & curse were food is concerned. 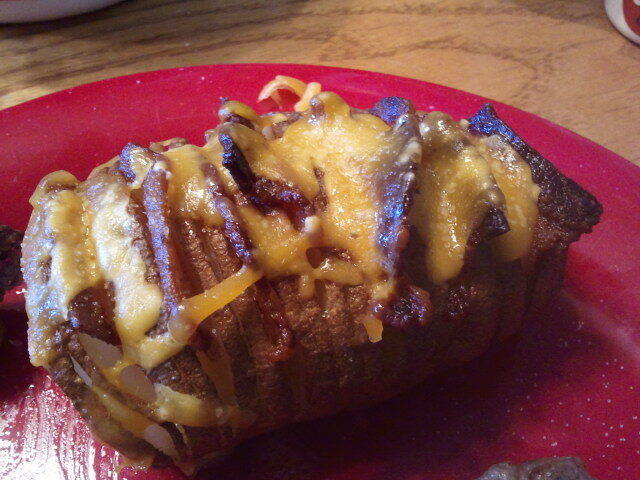 i saw these hasselback potatoes with bacon on pinterest a few weeks ago & knew i had to try them out. and just so you don't feel alone, i had NO IDEA what hasselback potatoes were either. i added cheese at the very end.. soo good. 1. preheat oven to 400. scrub potatoes. make vertical slices the length of the potato, but do not cut all the way through. place potatoes on foil lined baking sheet. 2. cut bacon into 2" pieces. insert bacon into every other opening in potato. 3. drizzle olive oil over potato. sprinkle with salt. 4. cook for 1 hour, or until done. remove from oven & sprinkle with cheese. they were so good & so easy! even the hubs who normally has gobs of sour cream on his potato ate them just like i served them! I've always seen hasselback potatoes served plain - this is sooo much better!